The STAR Business Blueprint™ is a framework we developed to help businesses get a clear picture of what needs to happen with their marketing. Once you understand the STAR Blueprint, it will give you a good filter for understanding which marketing activities you need to focus on and which ones can wait. It will help you avoid one of the deadliest enemies of effective marketing…fragmentation. Fragmentation is when you have a bunch of unconnected pieces of marketing that aren’t in communication with each other and aren’t working together under one cohesive plan. The first and most important stage of the blueprint is ensuring you can make a sale…ensuring you have an offer that, when placed in front of customers, converts. A sales conversion takes place any time a customer takes the action you want them to take. This can be purchasing your product or service, joining your email list, clicking a link in a Facebook ad, or picking up the phone and calling you. If you don’t have an offer that is converting, it’s pointless to spend time and money sending more people to your website or Amazon product detail page. You first need to do whatever it takes to get your offer to convert – improve your website, come up with better Facebook ads, create a better Amazon product detail page, etc. Once you have an offer that is proven to convert, you’re ready to increase sales by sending more traffic to the offer. Some of the ways this can happen is through paid social media advertising, Google Adwords, Amazon pay-per-click ads, enlisting the help of social media influencers, running product launches on Amazon, etc. Amplification is taking what you’re already doing that’s working and finding ways to get even greater results from your existing offers and traffic. One way to do this is to find ways to get your existing customers to purchase more frequently and spend more money with you. Another way is to find ways to more actively engage with your existing customers and get them to spread the word about your brand and refer others to you. Customer service improvements that increase satisfaction and positive reviews and decrease returns and negative reviews are also amplification. Reputation is about improving your brand’s image and protecting your brand. Reputation activities include getting more positive reviews and testimonials, going through Amazon Brand Registry, and taking control of your supply chain and advertised pricing. Want Help Applying the STAR Blueprint to Your Business? We love helping brands create strategic plans for growth! Your first half hour of consulting is free, so you have nothing to lose. Click here to schedule a 30-minute phone consultation! Brands have several options for how you can approach your presence on Amazon. It’s important to understand what your options are and what are the pros and cons of each option. In this episode we explain the pros and cons of 5 different approaches you can take to Amazon as a brand. Selling on Amazon is also called third-party or 3P, and it involves you and/or other 3rd-party merchants selling your products directly to consumers (B2C) on the Amazon marketplace through a Seller Central account. Selling to Amazon is also called first-party or 1P, and it involves you entering into a B2B wholesale relationship with Amazon where you sell your products directly to Amazon via a Vendor Central account, and Amazon then sells your products on their marketplace. Regardless of which route you go, you should always have your brand registered through Amazon’s Brand Registry program. Access to additional Amazon advertising platforms and opportunities – in the past it was Headline Search Ads, Enhanced Brand Content, Product Videos, AMG (Amazon Media Group), etc. Now most of that is being made available to brand-registered Seller Central accounts. Maximum control over pricing, inventory supply and product availability, product detail pages, etc. Enforce pricing agreements, content on product detail pages, etc. All of the above for 3P exclusive seller arrangement…one tweak to this arrangement is that you don’t make the exclusive seller purchase from you wholesale. Instead, your inventory gets sent in to Amazon and as it sells, the exclusive seller keeps whatever portion you’ve agreed and then sends the rest of the proceeds on to you. Need help deciding which route is best for your brand? Fill out this form and we’ll give you a free 30-minute phone consultation! 025 – Expert Interview: Sales Tax Liability – Are You at Risk? For many e-commerce sellers, dealing with sales tax is about as fun as getting a root canal. But we’re going to make an otherwise painful subject as easy as possible. This week’s podcast episode is an interview with Jennifer Dunn of TaxJar. Jennifer, though not a CPA, is an expert on topics related to e-commerce and sales tax liability. Here is one of the most important things you should know about sales tax: If you sell on Amazon via Fulfillment by Amazon using a Seller Central account, you likely have sales tax liability in 20+ states…anywhere Amazon stores your inventory. And even if you don’t use FBA, states are passing more and more laws that require you to report the sales you make in their state, even if you don’t have tax liability there. In most states, having a physical location in the state, or having employees there, or storing inventory there (including with Amazon FBA), or selling products at a trade show there gives you nexus and means you are required to collect and remit sales tax in that state. If you have nexus in a state, the state expects you to collect and remit sales tax even if you make just one sale there. For most businesses, it becomes a question of cost-benefit analysis. If you only have a few sales in a particular state it may be more cost in terms of time and effort to collect and remit sales tax in that particular state than to just pay back taxes and penalties and interest if the state ever decides to come after you. Jennifer points out that regular accountants and attorneys don’t specialize in the complicated tax laws relating to interstate commerce. She highly recommends you consult with a SALT…a State and Local Tax expert. Jennifer says most of the experts they’re connected to recommend you be thinking about registering for sales tax in a state if you make more than $3,000 a year in sales there. These laws don’t just apply to U.S.-based businesses. They also apply to businesses based in other countries that are making sales in the U.S.
Washington and Pennsylvania recently became the first two states to pass marketplace facilitator laws. These laws require marketplaces like Amazon to collect and remit sales tax in their state on your behalf. But this doesn’t let you off the hook. You still are required to have a sales tax with those states and report all your sales to them. Furthermore, if you have nexus in those states, that nexus applies to all your sales. So if you sell through your own website as well, you’re still responsible to collect and remit sales tax on your own website sales. In a couple of weeks, the U.S. Supreme Court will be hearing a case that could reverse the precedent set in 1992 in the Quill vs. North Dakota case. The way TaxJar expects the Supreme Court to rule is to remove the protections currently in place that say a business is only responsible for sales tax in a particular state if they have nexus there. If that happens, then businesses could quickly find themselves responsible for sales tax on e-commerce sales in nearly all states, whether or not they have nexus in those states. Which States Have Amazon Fulfillment Centers? To see which states have Amazon fulfillment centers (and which of those also have sales tax laws), check out this map on TaxJar’s blog. How Can TaxJar Help with these Issues? TaxJar (www.TaxJar.com) is online software that makes the task of tracking your sales and filing sales tax in various states FAR EASIER. It connects to all your different sales and payment platforms (Amazon, Walmart, eBay, Shopify, Stripe, Paypal, etc.) and gathers all your sales data from each platform. TaxJar then shows you in what states you made what sales. If you sell on Amazon using FBA, it also shows you in which states your inventory is stored. Additionally, TaxJar has an autofile feature that you can use to automatically file your monthly, quarterly, or annual sales tax returns in all the different states where you have registered for sales tax. Autofile costs $16-$25 per filing, depending on which monthly TaxJar plan you have. TaxJar has generously made a special offer to listeners of the eCom Leverage podcast. Use the code ECOMLEVERAGE when signing up to get 10% off an annual plan with TaxJar. Click here to sign up for the eCom Leverage email list and receive tips, strategies and other content in your inbox each week. We’ll help you make more sales online! 024 – Is Your House Built on Someone Else’s Land? If XYX platform got shut down or taken away from us tomorrow, how would that impact our business? Would it be just a bump in the road, or would the impact be devastating? How could branching out into new platforms add additional (potentially very profitable) revenue streams to our business? You don’t have to look far online if you want to find Amazon suspension horror stories. One such story is detailed in a CNBC article that was published in November of 2017. The article tells the story of Pure Daily Care, a brand that had grown to over $10M in annual sales in 7 years, thanks in large part to strong sales on Amazon.com. The brand was attacked by a malicious competitor who ripped off their IP and got tons of negative reviews posted on Pure Daily Care’s main product. Pure Daily Care ended up getting suspended by Amazon for 7 weeks during 4th quarter. They lost an estimated $400k in sales, got stuck with hundreds of thousands of dollar of inventory they had to sell at a deep discount, and had to lay off half their staff. Building your entire house on someone else’s land is risky business. Whatever you do, develop a strong audience that you own and control online…and grow your own website’s sales volume! Amazon can suspend you, but they can’t suspend your own website. You “own” the customers who buy on your own website. Amazon owns the customers who buy your products on Amazon. Building a strong audience of your own can help you improve your sales ranks on Amazon and launch new products. You’re still building on someone else’s land to some extend if you’re using a platform like Shopify (which is a great platform, by the way). You can get shut down or suspended if something goes wrong, and third parties can change their software or policies or go out of business. Your payment processor can suspend you, even if you’ve done nothing wrong (ask us how we know). Grow a list of customers and fans who have given you permission to stay in touch with them. Get their email addresses (regularly saved to a good ol’ fashioned spreadsheet…but check privacy laws), their phone numbers, and their physical addresses. Make sure you don’t get stuck in one way of doing things! Even if one thing is working great and driving most of your e-commerce sales, be constantly thinking 2-3 steps ahead. Identify the most profitable platforms/channels/methods to grow your sales next. Constantly ask yourself how dependent you are on a platform you don’t control, and what you would do if XYZ suddenly went away. In this week’s podcast episode we’re going to look at a hypothetical case study that will demonstrate the power of compound optimization. 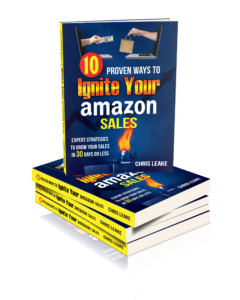 This will show you how seemingly small changes can add up to made a huge difference in your profits on Amazon. Brands that are just starting on Amazon know they have lots of work and big improvements to make. But we often see brands who are already experiencing success on Amazon mistakenly think their success means they have nothing to gain by working to further improve their Amazon presence. Brands in this situation often have no idea how much profit they’re missing out on by not continuing to improve on Amazon. I’m going to show you the possibilities, though! After listening to this podcast episode, you won’t fall into the same trap. You’ve heard about the power of compound interest. If you invest $10,000 at an annual rate of return of 10%, and you keep reinvesting all your earnings without pulling any money out, then after 40 years your initial $10,000 investment has grown to $452,593. That’s the power of compound interest. Compound optimization is similar. It involves stacking little improvements, just a few percent here and there, on top of each other over time until they add up to made a big impact. Here is a hypothetical case study, some of whose details are very similar to those of brands we’ve worked on. It’s admittedly overly simplified, but it will serve to demonstrate the potential of incrementally improving your brand’s presence on Amazon and sticking with it over time. You have a product that sells on Amazon at a $50 price point. Net Amazon payout per unit sold is $35. You are the manufacturer, and your product cost is $10, so your net profit per unit sold is $25. You are currently selling 300 units per month. So monthly sales are $15,000, and monthly profit is $7,500. You decide that you want to increase your sales by optimizing your product detail page. You improve your images and your bullet points, and you add Enhanced Brand Content to your product description. The effect this work has is increasing your conversion rate on the page from 8% to 10%. That means you sell an additional 75 units per month. So you added an additional $1,875/mo profit to your bottom line, and your monthly profit is now up to $9,375. You do some keyword research and discover that you’re not being indexed for a phrase that gets 2,000 searches per month. You add that keyword to your listing and get ranked in the 5th position on the first page of search results for that keyword. According to this study the 5th position gets an average of 7% of the clicks, so you just added 140 clicks per month. At a 10% conversion rate you start making an additional 14 sales per month, meaning an extra $350/mo in profit. Your monthly profit is now $9,725. You start spending $500 a month on Sponsored Products Ads with a 10% ACoS. So that ad spend is making you $5,000/mo in gross sales, which is 100 units. That’s $2,500 in profit, $2,000 after subtracting the product cost. So now you’re making $11,725 per month. Up until now, your average position on Amazon search result pages has been 5th in organic search results. Because of the optimization you’ve done, you’re now selling an additional 189 units per month. That is enough to move you from the 5th position in search results to the 3rd position. The 3rd position gets almost 12% of clicks, whereas the 5th position only gets 7%. So you just increased traffic to your product detail page by 70% and grew your sales and profits by 35% (to be conservative). Now your monthly profit is $15,829 per month. You’ve added over $8,300/mo profit to your bottom line, but we’re not done yet. You decide you want to grow some more, so for 3 months you invest $5,000/mo in a Facebook ad campaign to drive additional sales. You pay a 3rd party agency $2,000/mo to run the campaign, and you dedicate $3,000/mo to Facebook ad spend. You use this Facebook campaign to concentrate a significant volume of sales of your product on a chosen week each week for 3 months. Amazon loves sales you bring them from traffic outside Amazon. The result of the Facebook campaign is to push you from an average position of 3rd in Amazon search results to 1st. The first position is worth 35% of clicks as compared to 12% for the 3rd position, so you just almost tripled your traffic. Even though your traffic increased by 200%, we’re going to be conservative here and say that the effect this has is “only” to increase your sales by 50%. That means your monthly profit has now grown to $23,744. You now start consistently spending $3,000/mo on Sponsored Products Ads. Your ACoS on the new $2,500 you’ve added to your ad spend is only 25%, but that means it still brings you an additional $10,000/mo in sales, which is an extra $5,000/mo profit, subtract the $2,500 ad spend and you’re left with an extra $2,500/mo. That pushes your monthly profit to $26,244. All this time you have been using a well-crafted email follow-up campaign to engage customers, show them how to get the most out of your product, and troubleshoot issues before they arise. This has resulted in a few less negative reviews left for your product and a higher number of positive reviews. The shift moved your review score from 4.1 to 4.3, meaning your listing now shows 4.5 stars instead of 4 stars. The social proof of the higher review score, plus being the #1 search result (and having Sponsored Products Ads above that), plus gaining the Amazon’s Choice badge, means that an additional 1 out of 100 people who visit your product detail page decide to buy. Your conversion rate climbs another 1% from 10% to 11%, meaning that your sales and profits grow another 10%. This brings your monthly profit to $28,864. Now the holidays are coming. During two months around the holidays, your monthly profit doubles compared to the rest of the year. So last year you made $7,500/mo for 10 months, and then $15,000/mo for 2 months. This one product made you $105,000 on Amazon during the year, which isn’t bad. This year, after all the optimization you did, you made $404,152…an extra $300k by leveraging the power of compound optimization!! As it turns out, you’re in a market that is growing, and Amazon is growing also. This means that next year your sales increase another 15% before you even lift a finger. Oh, and did we mention that this product we’ve been working on is just 1 of 5 products in your brand? That is the power of compound optimization. Would you like to explore your brand’s situation some more? Get some insight on how you can grow your sales? Or troubleshoot issues like unauthorized sellers and MAP violators? We’re offering the first half hour of consulting free of charge! To book a 30-minute phone call (your time to talk about whatever you want), click here and pick the time that works best for you.